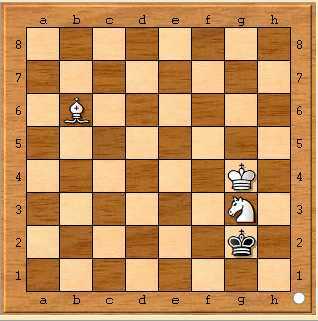 White, Stockfish, to move. It plays bb6-g1,losing the bishop and the win. Also strange: the same engine does not make this weird move in the Tarrasch program. Playing with KBN against K, I've seen Stockfish often blunder away the advantage in these endgame setups. Any clue how this could be happening, or why it would happen only with Arena? EDIT: SmallChess answer is correct. The problem was a residual, non-zero value in the position "number of half-moves" setting. See my reply to his posting for more information. This is not a blunder, expected behaviour from the engine. Everything worked as intended. Try to copy the FEN string out, and you'll know. Although the position looked winning, White didn't have enough moves to force checkmate before the 50 moves rule. Stockfish, knowing the position was a dead draw immediately asked for simplification. The position you had is 100% equal, there was no way to win it. It's a draw. What Stockfish did was not wrong. If the Tarrasch program didn't send out the 50 moves counter to Stockfish, you'd never get the problem on Tarrasch. If that was the case, it was an error in Tarrasch because the 50 move counter is part of the game. Setup a new board with the same position but reset the 50 moves counter. There must be an issue with your copy of Arena 3.5.1 because Stockfish found a mate in 20. I'm using Scid for my GUI. I have attached the moves. Not the answer you're looking for? Browse other questions tagged endgame stockfish blunder or ask your own question. How do i prevent blunders?